Vote now for the Glee Summer Music Showdown CHAMPION! 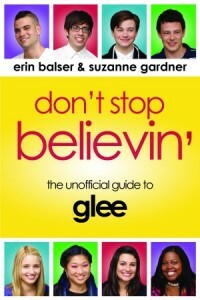 Remember the awesome Glee Summer Music Showdown that my co-author Erin has been running over on her blog? Well, it’s been rockin’ my summer, and I hope it’s been rockin’ all of yours, too, and that you’ve had fun rooting for your fave songs from the first season of Glee! And now, with less than 24 hours to go until the season 2 premiere of Glee, it’s time to make your choice for the best song of the first season of Glee. In the final match-up in this epic showdown, gleeks have voted to put “Don’t Stop Believin’ (Pilot)” vs. “Bad Romance.” It’s the song that started it all vs. one of the most talked about songs of the last decade. Which song are you going to vote for? Head on over to Erin’s blog before 8 p.m. EST (the start of the season 2 premiere!) to cast your vote! ← Listen to the first song of season 2, and find out what else you’ll hear in “Audition”! Can’t wait to see you both on Wednesday for the book launch! I vote for ‘Bad Romance’. It really showcases the talent of several members of the glee club (not just Rachel, who is in fact only doing backup in this song.) Quinn, Kurt and Santana get to strut their singing talent and to great effect. Now that’s what glee club should be about!